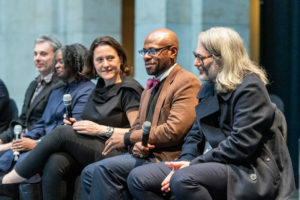 1/23/19 Anya Sirota, U-M associate professor of architecture and principal at Akoaki, Harley Etienne, assistant professor of urban and regional planning, and John Marshall, associate professor of art and design and co-founder of design studio rootoftwo, answer questions during the DIA Plaza competition. Scott Soderberg, Michigan Photography. 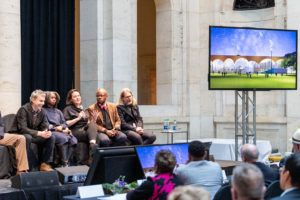 1/23/19 Anya Sirota, associate professor of architecture and principal of design duo Akoaki in Detroit, talks about the proposed canopy that would rise high and flexible as a DIA addition. It would be used to exhibit new works, large-scale exhibits and events. Scott Soderberg, Michigan Photography. When Craig Wilkins looked out into the audience during his team’s presentation at the Detroit Institute of Arts on Wednesday, he was happy to see many of his University of Michigan students in the crowd. 1/23/19 Craig Wilkins, a U-M lecturer in architecture and member of team Ten x Ten, answers questions during the DIA Plaza competition presentations. Scott Soderberg, Michigan Photography. 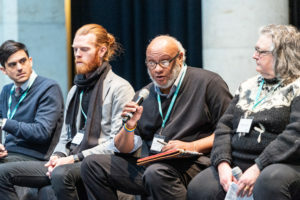 “It’s exciting to me that they’re getting a chance to see how these conversations really happen, because it is the same kind of thing that we talk about in class all of the time,” said Wilkins, a lecturer at U-M’s Taubman College of Architecture and Urban Planning. 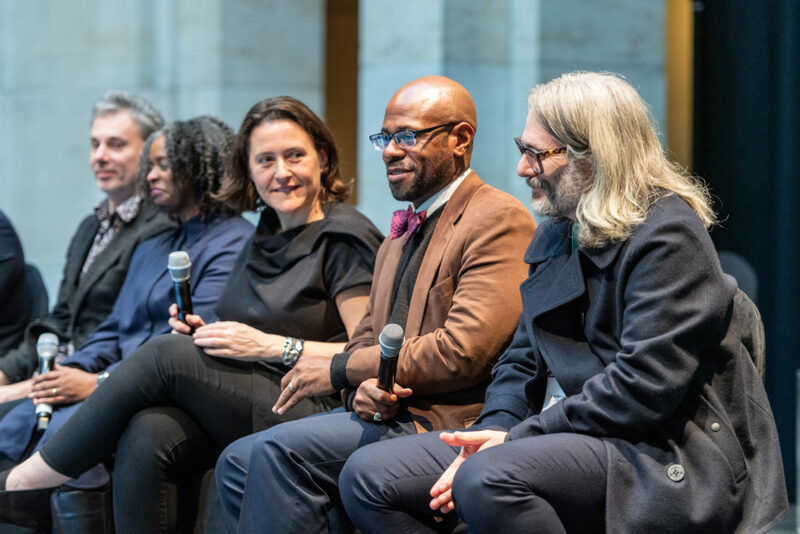 Three teams of urban and landscape design professionals—including two with U-M faculty from Taubman College and Stamps School of Art & Design—presented their visions of how to connect Detroit’s leading cultural venues into one destination in Midtown Detroit. The teams incorporated key community needs such as space for local artists to explore and exhibit work. The proposals will be on exhibit at the DIA through April 1. Wilkins and Joel Schmidt, principal of D MET Design and lecturer at Taubman College, are part of the team Ten x Ten, based in Minneapolis. U-M faculty Anya Sirota, associate professor of architecture and principal of design duo Akoaki; Harley Etienne, assistant professor of urban and regional planning; and John Marshall, associate professor of art and design and co-founder of design studio rootoftwo, are on the Agence Ter team, based in Paris. The third team, Mikyoung Kim Design of Boston, includes Kemba Braynon, a U-M alum and an associate in the Detroit office of Quinn Evans Architects. 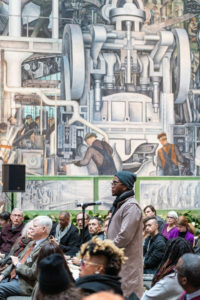 1/23/19 DIA Plaza Midtown Cultural Connections Competition presentations. Scott Soderberg, Michigan Photography. Ten x Ten presented its idea to create a park-like area around the dozen cultural institutions that would be called d.tour: Detroit Starts Here. 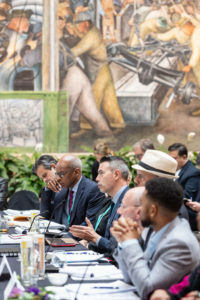 The international design competition was launched last year by the DIA and Midtown Detroit Inc. to unite 12 cultural and educational institutions, creating a connected cultural district and a town square for the surrounding neighborhoods. Sirota also showed several schematics that envision what the space might look like in each season as the elements of landscape and architecture meld together to create a shared stage for all the institutions. Teams also dealt with the nuts and bolts of street closures and parking. Agence Ter proposed narrowing Woodward Avenue by two lanes and closing secondary roads Farnsworth, Putnam, Kirby and John R, along with building a four-story parking structure that would bring more than 1,000 spaces to the district. “I wouldn’t be worth my salt as a planner if I wasn’t concerned about how people got in and out of the site,” said Etienne, adding that people might panic about closing roads such as John R, except that Brush Street would go from one-way to two-way traffic to allow access to the new parking structure. 1/23/19 Jonathan Massey, center, dean of the Taubman College of Architecture and Urban Planning, listens to presentations during the DIA Plaza competition. Massey is a juror for the competition. Scott Soderberg, Michigan Photography. A jury that includes Jonathan Massey, the dean of the Taubman College, will weigh in on the winner to be announced this spring. The 12 participating institutions in the cultural district are the Charles H. Wright Museum of African American History; College for Creative Studies; Detroit Historical Museum; DIA; Detroit Public Library; Hellenic Museum of Michigan; International Institute of Metropolitan Detroit; Michigan Science Center; The Scarab Club; University of Michigan; University Prep Science and Math Middle School; and Wayne State University. For Wilkins, the experience has been exciting, and the team’s design focused on making the space democratic. 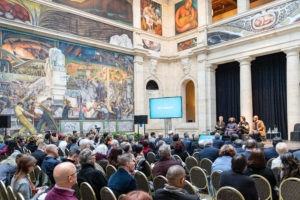 1/23/19 Finalist teams take questions from the audience during the DIA Plaza competition at the Detroit Institute of Arts Riviera Court. Scott Soderberg, Michigan Photography.